Barrie Colts 2018 NHL Draft Prospects: Joey Keane. #OHL #NHLdraft - Very Barrie Colts | A website covering the Barrie Colts of the OHL. Joey Keane is currently ranked 111th among North American draft eligible players by NHL Central Scouting. 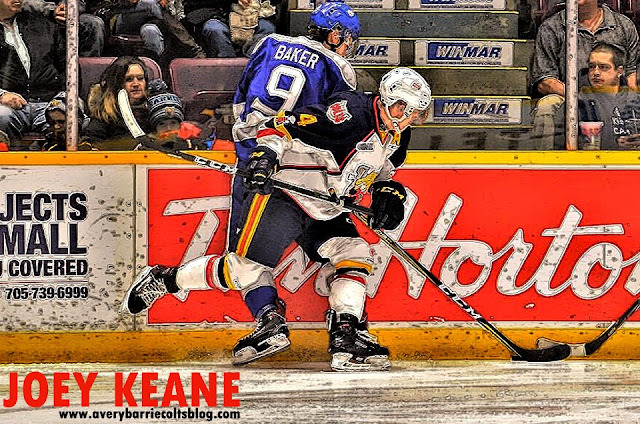 Joey Keane was drafted by the Barrie Colts 87th overall in the 2015 OHL Priority Selection. Keane went on to play for the Dubuque Fighting Saints of the USHL in the 2015-16 season. Through 55 games played, Keane totaled 2 goals and 9 assists. The Fighting Saints would make it to the Clark Cup Championship only to be swept in 3 games by Tri-City. Keane scored a goal and added an assist over 12 playoff games. The 2016-17 season saw him join the Barrie Colts. The rookie finished his first OHL season scoring one goal and putting up 19 points over 67 games. This was a hard season for the Colts, being just the 2nd time in team history that the Colts didn't reach the playoffs. Joey made huge strides in his sophomore season with the Ponies. In the 2017-18 season, Keane more than doubled his point production from the previous season, scoring 12 goals and 32 assists in 62 games. He was also named an alternate captain of the Colts. His 44 points was the most among Colts defencemen and 8th most on the team. He finished the season 13th for points among defencemen and would get named to the OHL Note: he accumulated 44 points and he didn't even get a shot on the Colts first power play unit. Third All-Star team at the seasons end. Joey Keane was ranked first as the Most Improved Player and Best Defensive Defenceman in the OHL via the OHL Coach's Poll. Keane has been incredibly overlooked headed into the NHL Draft. He is one of the best offensive defencemen in the OHL and is recognized as one of the top "sleeper" picks. His puck moving ability has come a long way since his rookie season and he is arguably one of the best skaters in the league. Aggressive to play against; and does a great job of pinning opposing forwards along the boards to help gain puck control. Though he is so strong offensively, he is rarely caught in the offensive zone. One of his biggest strengths is his ability to rush the puck from his own zone and create chances offensively. His defensive game is also on point and he is very effective at controlling opposing forwards. Being named the Best Defensive Defenceman (as noted before) by OHL coaches is a big deal. He really gets noticed for his ability to control the play in his own zone. Keane finished the 2017-2018 season with a +45 rating. He was not on the ice for many goals against due to stellar defensive ability. The 2018 NHL Draft is set to take place in Dallas, Texas on Friday June 22nd at the American Airlines Center.